o area of Portland, Oregon played a more important role in street railway history than Northwest Portland and the neighborhood known as Slabtown. 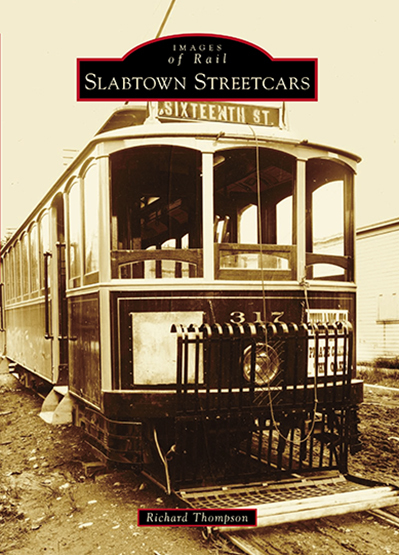 In 1872, the city's first streetcars passed close to Slabtown as they headed for a terminus in the North End. Slabtown was also homre to the first streetcar manufacturing factory on the West Coast. In fact, until locally built streetcars began to be replaced by trolleys from large national car builders in the 1910s, more than half of all railway rolling stock was manufactured in shops located at opposite ends of Northwest Twenty-Third Avenue. All streetcars operating on the west side of the Willamette River, including those used on the seven lines that served Northwest Portland, were stored in Slabtown. When the end finally came in 1950, Slabtown residents were riding two of the last three city streetcar lines. Historian Richard Thompson, a former museum director, school librarian, and trolley crew coordinator, has been fascinated by streetcars since riding them as a boy in the 1950s. His photograph collection has served as a resource for five books in Arcadia Publishing's Images of Rail series, which he hopes will spark a new interest, or nostalgic memories, for readers.